A delicious mix of Cheeses, Chutneys, Chips, Dips, Wafers, Lollies, Nougat, Shortbread, Fudge Brownie, Wine Jelly, Crispy Rolls, Peanuts, Snack Mix and Meringues. Packed full of gourmet treats for that special occasion. 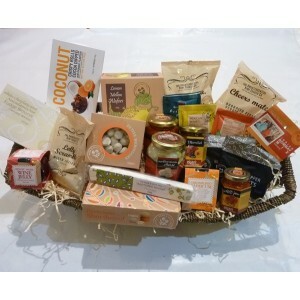 This tempting Gourmet Basket is presented in either a cane basket or a black cardboard tray and is full of extra special treats unavaliable from the supermarket .